Nelly Sachs was an author who wrote about the Jewish experience of Nazi oppression in her prose and poetry. She was awarded the Nobel Prize for literature in 1966. Nelly Sachs grew up in Berlin in a well-to-do Jewish family. She was the only daughter of Margarete Sachs and the factory owner William Sachs. Her maternal grandmother also lived with them, which meant that Nelly’s upbringing was influenced by two generations of women. 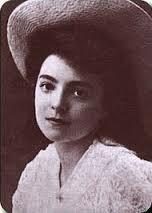 As a young girl Nelly Sachs favoured her father’s company – he was artistically inclined and played the piano while his daughter danced. She came to think of dancing as her “innermost aspect” which in many ways later found expression in her poetry. Niddy Impekoven, a popular dancer in Berlin, was an important source of inspiration. Nelly Sachs’s ambitions to be a writer emerged when she was young, and she turned to role models such as Selma Lagerlöf, and Herman Hesse, for advice on writing. She debuted not as a poet but as a prose writer with a collection entitled Legenden und Erzählungen, 1921, characterized by a medieval imaginary world with overtones of myth and fairy tales. She had already begun writing sonnets in 1910, which she sent to Selma Lagerlöf in 1923 seeking her opinion on them. However, it was not until 1929 that she decided to publish her first poems in the Berlin newspaper Vossische Zeitung. When her father died the following year she released a series of poems in which she worked through her sorrow. Until her exile in Sweden she wrote approximately 300 poems, several of which were published in German newspapers. Nelly Sachs later distanced herself completely from these early pieces of writing. She insisted that her actual debut occurred once she was in exile and published In den Wohnungen des Todes in 1947. When the literary researcher Walter Berendsohn compiled her bibliography to mark her 75th birthday in 1966 she made clear that “all of her work which pre-dated 1940 should be left out”. This is why her early work has only recently gained significant scientific attention. How should Nelly Sachs’s decision regarding her early work be understood? There are clearly definitive breaks in her life and her poetry which coincide with the growing Nazi terrors of the 1930s and the increasingly detailed reports of the Holocaust which emerged in the early 1940. Her poetry from Berlin is romantic in nature and lacks both the language and the awareness required to confront those realities. Nelly Sachs grew up in a secular environment. Her family was assimilated into German society and did not have a strong relationship with specifically Jewish traditions. Once the Nazis had seized power in Germany in 1933 the situation for the country’s Jews became increasingly precarious. The brief, condensed prose of “Leben unter Bedrohung”, which was written after her flight to Sweden, presents an eerie image of life in the terror-ridden Berlin. It is likely that the experiences portrayed refer to visits from SA and SS soldiers at the forced sale of the family house on Lessingstraße in 1939. For a brief period Nelly Sachs lost the ability to speak. “For five days I was living without a reason, as though during a witch trial. My voice was gone. It left without a care for my remaining limbs, which remained terrified. My voice vanished as it no longer had any answers and ‘speaking’ was forbidden.” After these experiences it was impossible for her to maintain a romantic world view that was full of melancholy and ethereal longing. Her identity as a person and poet was fundamentally altered, as symbolised by the requirement that from 1 January 1939 onwards she, along with all other Jewish women in Germany, were forced to take the name Sara. In the end, flight was the only way out. During the months of June and July 1939 Nelly Sachs’s friend Gudrun Harlan travelled to Sweden in order to ask the aging Selma Lagerlöf to provide a written recommendation to the Swedish government to provide Nelly Sachs and her mother with residence permits. Lagerlöf’s succinct phrasing would become the Sachs’ salvation: “It is important to me that Miss Sachs be received here in Sweden.” On 16 May Nelly and her mother embarked on one of the last flights out of Tempelhof in Berlin destined for Bromma airport in Stockholm. Between the two of them they had 5 German mark, a thermos of fenugreek tea as Nelly’s mother was unwell, and a single brown suitcase full of clothes, manuscripts and photographs, as well as a few items such as Nelly’s father’s medals, a music box and Nelly’s bookmark album. It is highly likely that she escaped certain death at the very last moment. Even though Nelly Sachs’s world view had already begun to crack before she went into exile, her love for Novalis and the romanticists never ended. She remained a mystic, but her mysticism took on an altogether different tone and direction. It was during these first years in exile that she believed she had a calling where she no longer saw herself as the focal point of creation but rather as an anonymous voice of the victims. Her new poetic role emerges in the 1947 collection entitled In den Wohnungen des Todes, in part as she takes on the role of a choir leader of the Jewish people and victims, with choirs, epitaphs and laments. She also reveals a much more independent language, with harsher imagery and a looser style. It was her intense exposure to the rapidly developing modern poetry in Sweden at that time that brought about his change. When Erik Lindegren’s collection mannen utan väg was published in 1942 Nelly Sachs, in a “sleepwalking” manner, managed to find a copy in a bookshop. Her volume of German translations of Swedish modern poetry which was released in 1947 entitled Von Welle und Granit contains four sonnets from mannen utan väg. This volume also includes poems by Karin Boye, Edith Södergran and Johannes Edfelt. Following her “actual” debut, Nelly Sachs emerges as a strongly contemporary modernist who found an entirely new direction in exile. Nelly Sachs was very close to her mother during the initial years of exile. While her mother slept she would write at night in the small kitchen they shared in their apartment, which she referred to as her “cabin”. Her mother’s death in 1950 led to yet another new phase in her life. In one way she became even more fragile, but she also sought deeper consolation in Jewish mysticism. She began to read the medieval Kabbalic rolls Sohar, and in the ensuing years the theme of flight became more marked in her collections Und niemand weiss weiter, 1957, and Flucht und Verwandlung, 1959. She also composed a large number of dramatic scenes, partially influenced by Samuel Beckett, and became acquainted with the Paris-based poet Paul Celan, whom she addressed as her brother in their letters and felt connected to through their shared experiences of persecution. Nelly Sachs’s demons remained with her and in 1960 she was admitted to Beckomberga hospital as a result of severe psychological difficulties. She had a lot of support from her close friends, the couple Bengt and Margaretha Holmqvist, and a group of female friends which included the artists Lenke Rothman and the actress and director Inge Waern. Gunnar Ekelöf held a particular place among her friends as he sent her one of his icons as a comfort in the winter of 1961. She translated the first part of his collection Diwan över fursten av Emgión into German, and he translated her Glödande gåtor, 1966, into Swedish. Nelly Sachs never lost her creative spirit during the last decade of her life. She also enjoyed a lot of freedom at the institutions where she was being treated. This was the period during which she wrote the condensed collections Noch feiert Tod das Leben, 1961, Glühende Rätsel I-IV, 1962-1966, and the posthumously published Teile dich Nacht, 1971. In 1966 she received the Nobel Prize for literature along with Samuel Agnon. Nelly Sachs died in May 1970 and is buried in the Jewish cemetery in Solna. Leonie (Nelly) Sachs, www.skbl.se/sv/artikel/NellySachs, Svenskt kvinnobiografiskt lexikon (article by Anders Olsson), retrieved 2019-04-23.